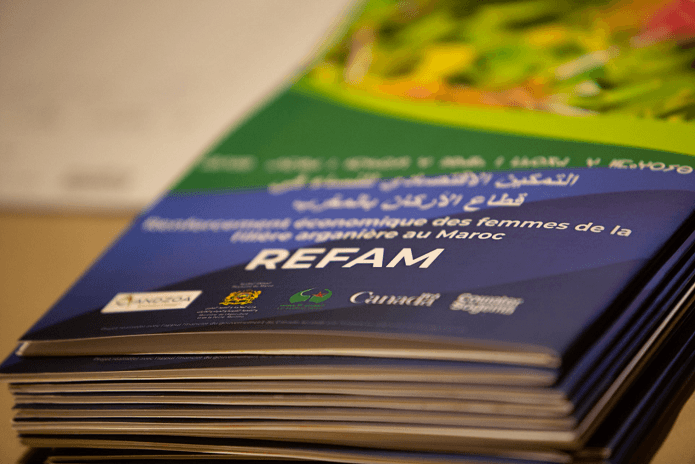 A workshop was organised to launch the project Renforcement économique des femmes de la filière arganière au Maroc (REFAM), funded by Global Affairs Canada and the National Agency for the Development of the Oasis and Argan Zones (ANDZOA), at the Palais des Roses Hotel in Agadir on 21 March 2019 and brought together more than 175 actors from the sector. Worth a total of CAN$11.5 million, the four-year REFAM project will contribute to sustainable economic growth in Morocco by providing targeted support to women working in the argan tree sector. This will be achieved through integrated actions to remove barriers to women’s entrepreneurship. REFAM will support women in the expansion of their economic activities through better access to information and market opportunities at home and abroad, as well as through increased awareness of the gender barriers that hinder their contribution to decision-making in their households, communities and sectors. The project also offers support to the Fédération interprofessionnelle de la filière de l’argane (FIFARGANE), which is an appropriate vehicle to promote exchanges between the various actors in the profession. REFAM operates in the Argan Biosphere Reserve (RBA). Through the development of a geographical information system (GIS), it supports the protection actions implemented in the RBA aimed at the sustainable management of the argan production. The project is being implemented by CowaterSogema in partnership with the National Agency for the Development of Oasis and Argan Zones (ANDZOA).